The $SPY is in a pattern known as an RSI divergence. This is where the market makes a new low relative to recent pivots, the RSI does not. Keep in mind that stretched markets can become even more stretched. So while there may be plenty of oversold readings or divergences, price can still head lower. 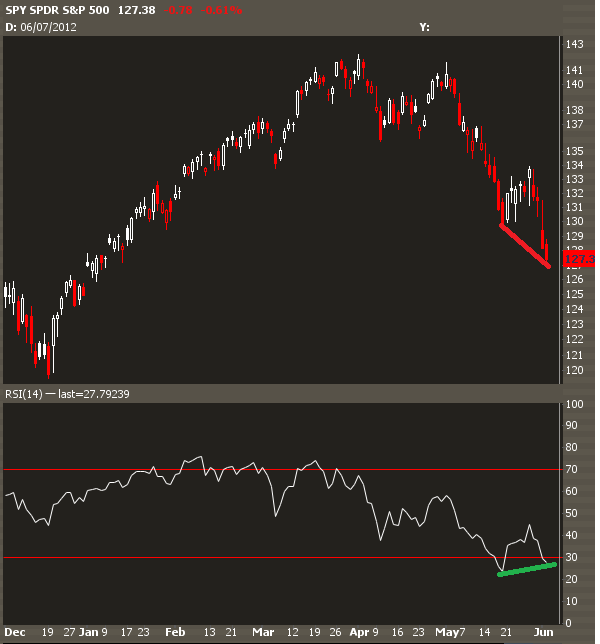 This divergence is telling us that the odds of increasing momentum to the short side is much lower. With an elevated volatility environment already, buying puts as a form of insurance is probably too expensive. If you need a hedge, put calendars are a better choice right here. The general feel from the media and other people I talk to is that a eurozone breakup is inevitable and we are in crash mode. I tend to disagree with this premise from a macro and technical level, but I am not willing to stake a large amount of capital on that bet. Odds are we are in for a big, dumb, ugly, stupid, macro range for the rest of the summer. Plan your trades accordingly.